"Very easy and fast to make from scratch and healthy, too. In Brazil, this cake is a favorite along a cup of coffee for breakfast. 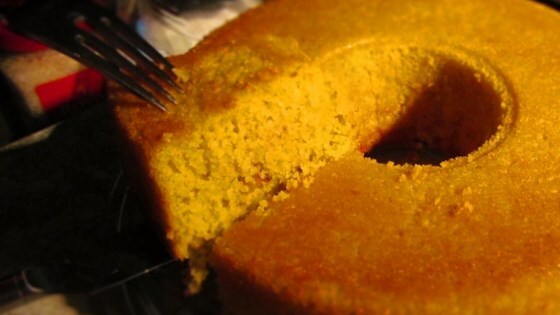 It is very similar in texture to a cornmeal bread, but only this is a sweet cake instead. Stir your favorite seeds or walnuts into the blended batter before pouring into the pan, if desired." Preheat oven to 340 degrees F (170 degrees C). Grease and flour a 10-inch round cake pan. Blend cornmeal, sugar, milk, coconut milk, flour, eggs, and vegetable oil in a blender until smooth; add baking powder and blend to integrate. Pour the cornmeal mixture into the prepared cake pan. Bake in the preheated oven until a toothpick inserted into the center comes out clean, 30 to 40 minutes. I use coconut oil but, for neutral flavor, use canola oil. In Brazil, people usually mix a pinch of fennel seeds into the batter. This is how my mother makes it. I use walnuts instead, just because I add walnuts to everything. Brown sugar and white sugar can be used interchangeably in this recipe, to taste preference. You can use 2 cups of regular milk, if you don't like coconut milk, in which case the amount of oil should be increased to 1 full cup. Made it without the coconut milk. Used 1cup white sugar and half cup brown sugar. Everyone loves it. Will use this as my goto from now on. Followed the recipe as outlined. It's too sweet and may be better with a coarse corn meal. I would not make this again.